Today, the Dalai Lama gave a lecture to members of the Japanese Diet, and I was invited to attend. Not, of course, because I’m a member of the Japanese Diet, but one of my students is, and I helped out a little bit with the preparations for the event, so I got an invitation in return. Obviously, this is the sort of invitation you don’t pass up; it’s not an opportunity that comes along very often, even with the Dalai Lama’s energetic schedule of public engagements. There were 130 or so parliamentarians there, from all parties. The prime minister didn’t attend, because China gets very annoyed when people pay attention to the Dalai Lama, but Shinzo Abe, the leader of the opposition, was there, because he really doesn’t mind annoying China. He spoke briefly at the beginning, and was given a white scarf as a symbol of friendship by the Dalai Lama. 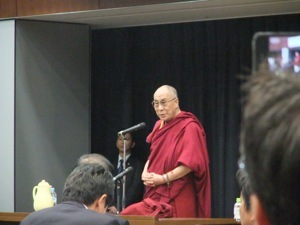 The Dalai Lama spoke in English, with a following translation into Japanese. The interpreter was very good; on a couple of occasions the Dalai Lama spoke for almost ten minutes before letting her translate, but although she got the order of things a bit jumbled a couple of times, she did cover everything he said, and did so accurately. I don’t think she got a script in advance, so it was a very impressive performance. However, I have to say that the Dalai Lama told his own jokes better than she did. The Dalai Lama started by saying that he thinks of all people as brothers and sisters, and would speak frankly, so he apologised in advance if he went against any local traditions. He mentioned that he has visited Japan a number of times, and has become quite familiar with the culture, and doesn’t really like it when people sit too stiffly and formally while he’s speaking. I still tried not to slouch, though. His lecture fell into three main parts. First, he spoke as a human being, second as a Buddhist monk, and finally as a Tibetan. Speaking as a human being, he said that he wanted to emphasise that everyone was fundamentally the same, physically and psychologically, and that Tibetans and Japanese, in particular, looked pretty much the same. Everyone, he said, has the right to seek happiness, and we should support them in that. He pointed out that, in the past, there has been a strong barrier between “us” and “them”, and this has led to people trying to defeat “them” in order to secure more for “us”, whether through cheating, bullying, or outright war. However, he believes that in the 21st century we need to dismantle that barrier, and think of everyone as part of a large “us”. We should be working for the happiness of everyone in the world, not just for the betterment of our own group, and part of that is not emphasising the differences between groups. He said that when we cheat or bully others, we are also hurting ourselves, because human beings are social animals, and always rely on others. In addition, hatred and hostility are physically bad for us, while habitual lying causes great stress. On the other hand, working honestly to benefit others gives rise to self-confidence and inner peace. We all need real friends, artificial ones not so much, and the only way to make them is to behave honestly and transparently, so that we can build trust with them. Speaking as a Buddhist, he quoted a quantum physicist he met in Argentina, who said it was important for him not to get attached to quantum mechanics. He said that, as a Buddhist, he should also not get attached to Buddhism, because if you do that, you become biased, and unable to understand the other person’s point of view. He pointed out that, although religions claim to teach compassion and forgiveness, they have often been the cause of violence and oppression, a sad state of affairs. Religions, he noted, vary a great deal in their philosophy, some having a creator, while others, like Buddhism, have no creator and instead believe in self-creation. However, he insisted that these differences were good, because people are all different, and no one philosophy can be suitable for all of them. He said that if religions had respect for each other, they could get back to their original purpose of being a force for good in the world. He went on to say that human beings have a great advantage over other animals: their intelligence. Other animals are controlled by their emotions, but humans do not have to be. They can use their intelligence to override their emotions, and suppress the destructive ones while encouraging compassion and toleration. He said that a lot of the problems with religion arise when people do not properly use their intelligence, and instead rely purely on their emotions. Finally, he spoke as a Tibetan. His first point was about the ecology of the Tibetan plateau, which a Chinese ecologist has called the “third pole”, in addition to the north and south poles. (That phrase seems to have spread; I’ve seen it several times in Nature.) It is suffering from global warming and deforestation, but that doesn’t just affect the six million Tibetans. Around a billion people in Asia live along rivers that rise in the Tibetan glaciers, although there is no direct connection to any Japanese rivers. Preserving the environment in Tibet is also vital for their life. Then there is the culture of Tibetan Buddhism. This, again, is not valued only by Tibetans, but also by people around the world, including a large number of Chinese. He stressed that there was no necessary connection between Tibetan Buddhism and separatism, pointing to the example of India, where languages, writing systems, and religions differ greatly across the country, but there is no risk of separatism. If the Tibetans were given the freedom to practise their culture within China, there would be no need for them to leave. He then excused himself from talking directly about politics, saying that he had retired from politics completely, and that if, after saying that, he went on making comments about it, he would be a hypocrite. Finally, he mentioned that there were a lot of female Diet members in the audience (there were; I think they were probably somewhat over-represented), and commented that this made him very happy. He mentioned that when he visited the European Parliament, there were a lot of female parliamentarians, some of whom were very attractive, and that also made him very happy. (When you’re the Dalai Lama, you can get away with that. Especially when the translator uses a Japanese word that is less directly connected to physical appearance.) His main point, however, was that equality between men and women was an essential part of the modern world, and that he was happy to see that it was recognised in Japan. There was only time for one question at the end, and one Diet member asked what they could do to help Tibet. The Dalai Lama suggested that they visit Tibet, taking ecologists and journalists with them, to see what was happening. He expressed concern that the central government in China was not receiving accurate reports from regional officials, but that foreign visitors might be able to tell them what was really going on. The event finished with a declaration of support for Tibetans, and the announcement of the formation of a group of Diet members dedicated to working to support the Tibetans. After this lecture, I can see why the Dalai Lama has a reputation for wisdom; everything he said struck me as wise (except, possible, the comment about female MEPs). Obviously, in a one hour lecture (half an hour when you factor in the need to translate) he had to leave a lot of the practical problems untouched, but I can’t find anything to disagree with in his general suggestions. It is, of course, refreshing to find a major religious leader stressing that the world needs lots of different religions, but I agree with everything else he said, as well. Does that mean I’m wise? Maybe I have one three hundred millionth of the Dalai Lama’s wisdom just as, as an EU citizen, I have one three hundred millionth of a Nobel Peace Prize. What an amazing opportunity. I’ve only ever seen His Holiness speak online, but have always been impressed. He certainly has a wisdom that speaks far beyond Buddhism, and is applicable to just about everybody, regardless of faith.